« Schenk History Now Available on DVD! 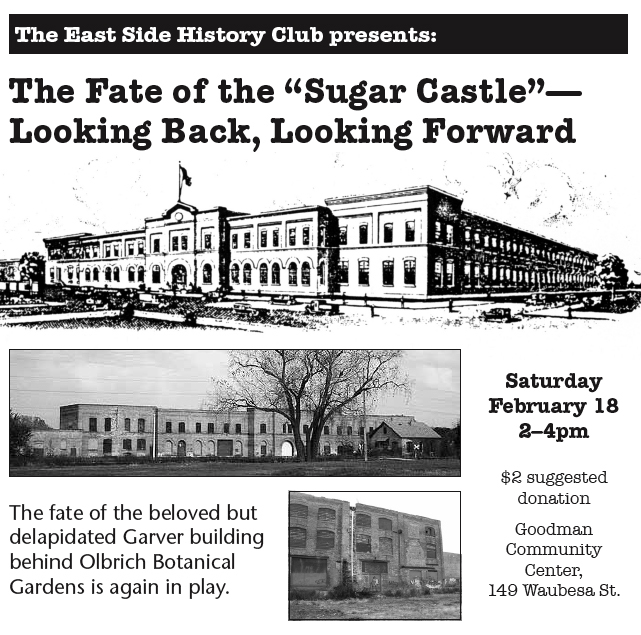 Anyone who’s visited Olbrich Gardens has likely noticed what remains of an East Side landmark—the “Sugar Castle.” At our February 18 meeting we’ll review the site’s history and discuss the current state of plans for future preservation and use. This large industrial complex was originally the United States Sugar Co. beet-sugar factory. More recently Garver Feed Mill operated there until 1997. The property’s fate had seemed secure with the approval of a plan by Common Wealth Development for an arts incubator modeled after the Torpedo Factory in Alexandria, VA. But in May 2011 Common Wealth scratched its plans, citing the challenges of fundraising in a recession for the $15 million project, of which only $3.3 million in public funds had been assured. The city hopes to move quickly on a new plan regarding the fate of the building, which has been designated a Madison Landmark. This entry was posted on February 8, 2012 at 5:29 pm	and is filed under Uncategorized. You can follow any responses to this entry through the RSS 2.0 feed. You can leave a response, or trackback from your own site.